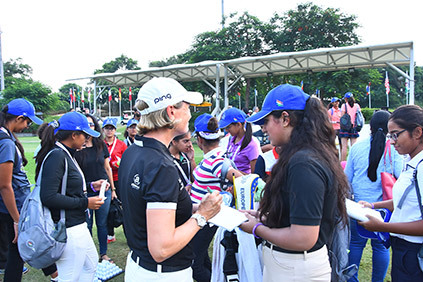 The 2018 Achievers’ Camp concluded at the Hero Women’s Indian Open with the girls being photographed with the event winner, Becky Morgan, at the prize giving ceremony. :Ninth time lucky. That’s what Becky Morgan ought to be saying. After 18 years, most of which were spent on either side of the Atlantic and playing 118 tournaments thus far, she finally found success on her 119th start. Tvesa Malik and Gaurika Bishnoi were the best Indians in Tied-13th place as the curtain rung down on the Hero Women’s Indian Open on Sunday. The two youngsters, who are only in their second year of professional golf, shot 73 and 72 respectively to finish at 1-over 289. They were eight shots behind the eventual winner, Becky Morgan (68, and 7-under 281). 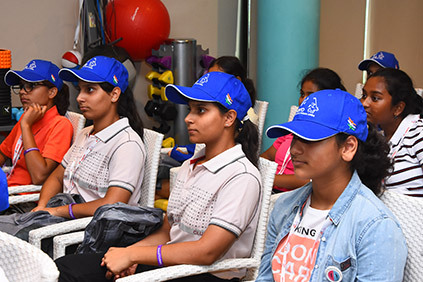 Teenager Sifat Sagoo, youngest of the Indian players in the field, emerged as the low amateur after a superb round of 2-under 70 on the final day of the Hero Women’s Indian Open. :Teenager Sifat Sagoo, youngest of the Indian players in the field, emerged as the low amateur after a superb round of 2-under 70 on the final day of the Hero Women’s Indian Open. 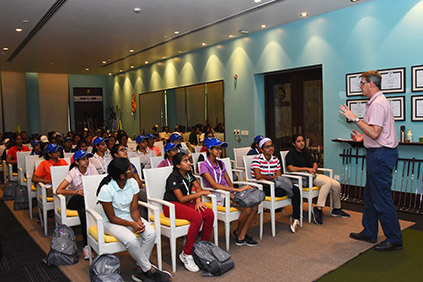 :The closing stretch at the Gary Player course took a heavy toll of the overnight leaders and allowed a group of chasers to not only catch up but actually overtake them in the third round of the Hero Women’s Indian Open 2018 on Saturday. :Tvesa Malik, making only her second appearance at the Hero Women’s Indian Open as a professional, carded one-under 71, but she felt it could have been way better.Club. :Austrian Christine Wolf devoured birdies like never before to card a second successive 4-under 68 and open up a massive four-shot lead over the rest of the field at the halfway stage of the Hero Women’s Indian Open 2018 at the DLF Golf and Country Club. :Norwegian star Tonje Daffinrud sizzled at the finish with a hat-trick of birdies to separate herself from the rest of the field and open up a handy two-shot lead on the first day of the Hero Women’s Indian Open 2018. 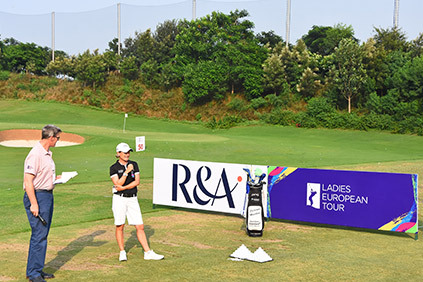 Daffinrud is hoping to emulate fellow Norwegian Emily Pedersen, who won in 2015.
: Ridhima Dilawari, just 20, and playing only her second event as a professional, was the toast of the Indian contingent, when she returned a card of 3-under 69 to be placed T-5th in the first round of the Hero Women’s Indian Open 2018. She is three behind leader, Norwegian Tonje Daffinrud (66). : Scotland’s Michele Thomson, who came so close to grabbing her maiden Ladies European Tour title, is hoping to go one better and fill that gap in her resume by winning the 2018 Hero Women’s Indian Open. 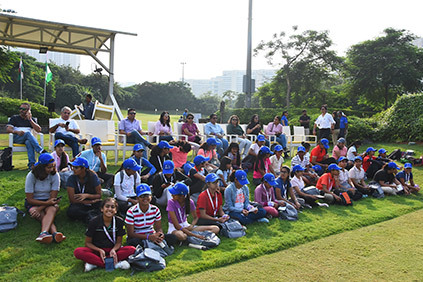 : The strong European Team got off to a winning start at the Skills Challenge, the traditional forerunner to the Hero Women’s Indian Open at the challenging Gary Player course at the DLF Golf Resort. : England’s Sophie Lamb is to turn professional at this week’s Hero Women’s Indian Open at DLF Golf and Country Club in Gurgaon. 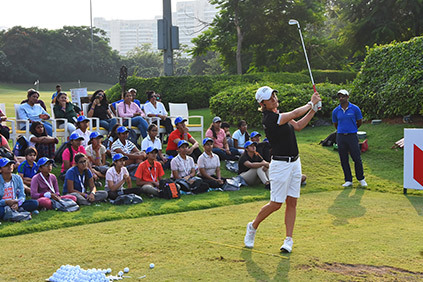 : Camille Chevalier will return to the scene of her maiden victory in the Hero Women’s Indian Open at DLF Golf and Country Club in Gurgaon next week, looking for back-to-back titles. 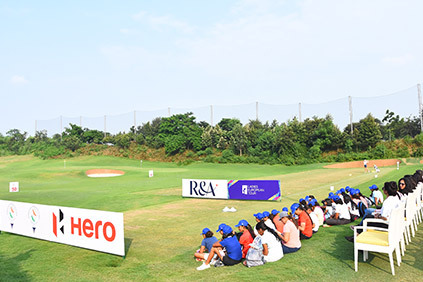 : The Hero Women’s Indian Open is set to return for its 12th edition with as many as 120 players from over 30 countries vying for the coveted trophy and the highest-ever prize purse of US $500,000.